Alison on the very wet coast of N. Ireland. Her Hyperlite Mountain Gear Daybreak Pack has thousands of dollars of camera gear in it. This despite on and off torrential wind and rain for days on end. Skiing out to get food during the the Blizzard of 2016. It’s nearly waterproof. Important when you’re carrying expensive cameras, electronics or clothing you’re depending on to stay warm, like a down jacket. It’s tough. The black Dyneema Composite Fabric (DCF), is strong and waterproof, but still light. Pockets are durable, solid fabric. It’s light. At just over a pound for a 17 liter capacity, it is significantly lighter than most waterproof packs. Fast gear Access. The clamshell, waterproof top zipper gives faster access to the main pack-bag vs. packs with lids, or roll-top closures. The Daybreak has the perfect combination of external storage: a large bellows back pocket; two side pockets for water bottles, etc. ; a nice rear bungie system that you can attach a helmet, crampons or rainwear, etc. ; and additional attachment points on both the back of the pack and on the shoulder straps. In summary, you can carry a lot of gear, organize it well and access it quickly. “Precisely what you need and nothing more.” And finally as with all HMG products the 20 ounce Daybreak Ultralight Daypack epitomizes HMG’s minimal but supremely functional design. As such, they’ve included small details like drain holes for the external pockets, a zippered security pocket for passport, wallet, cash and keys, etc. ; and an internal sleeve pocket (I use for maps/papers on-trail and for my 13″ laptop when off-trail/traveling). Oh, and the waist belt is beefy enough to actually handle a decent load! There are a number of cheaper functional daypacks. We’ve outlined some of our favorite daypacks in 3 lb Ultralight Day Hiking Checklist. So why is the $225 HMG Daybreak Ultralight Daypack our favorite? When flying we use or Daybreak packs as our under-seat carry-ons. Then when off the plane, we can live out of this same pack for a week of overnight hiking in foreign countries. Second, we use our Daybreak Daypacks over and over again. As such the cost is very reasonable if you spread it out over many trips per year over a number of years. E.g. the pack goes on international trips (both carry on luggage and on-trail pack), X-country ski trips, surviving temporary immersion when canyoneering, mountaineering, and trips all around the world. We know that our packs will survive whatever the terrain or weather dishes out. The fabric is strong and durable and up to bushwhacking and abrasion on rocks. It doesn’t have annoying mesh pockets that snag and tear on everything in creation. And we know that the inside of our pack will remain relatively dry. This is especially important to us since we seem drawn to hiking wet and cold places like Patagonia, Scotland, Iceland, and South Island of New Zealand, etc. It’s excellent external storage keeps our most needed gear easily accessible. This is much faster and convenient vs. diving into the main bag for commonly needed items. The huge, rear pocket and shock cord attachment system are keys for this. Finally, the packs are amazingly light given how waterproof and durable they are. Greatly appreciated as much when traveling as when we are on the trail. This post contains affilate links. If you make a purchase after clicking on the these links, a slight portion of the sale helps support this site at no additional cost to you. I am never under an obligation to write page post a review about any product. Finally, this post expresses my own independent opinion. Hyperlite Mountain Gear provided the author a sample of this pack for review. Rain jacket “durability” is a complex topic not well understood by most people. This post debunks some durability myths and clearly lays out what to look for in a durable rain jacket. Finally, we list some of the very best durable rain jackets on the market that are also light! If you can’t wait, jump to see our Best Durable Rain Jackets here. Or the new complete list of Best Ultralight Rain Jackets for Hiking and Backpacking. This includes a section Rain Jacket Breathability 101 or why waterproof-breathable rain jackets get an unfair bad rap! What is Rain Jacket Durability? In brief, rain jacket durability is a complex topic that includes the jacket remaining waterproof while continuing to breathe (vent body moisture), the shell fabric not ripping, seams not failing, and zippers, elastic adjusters, velcro etc. continuing to work without massive cleaning and maintenance. The 12 oz REI Co-op Rhyolite with its 3-layer eVENT fabric is durable AND Light. At half the price of competitor’s jackets, it’s a great value! Note: outer shell fabric “wet out,” the breakdown of this water shedding property, does not completely stop all breathability as is popularly believed. See more below. The WPB membrane should remain physically intact under the wear and tear of garment use (not so easy in regular use with a backpack!). In particular the WPB membrane should not delaminate from the outer shell, develop cracks, etc. In this case, 3-layer construction jackets are likely more durable. That’s because their inner fabric liner protects the more delicate WPB membrane vs. the unprotected membrane of 2.5 layer jackets. The WPB membrane should not foul with body oils, dirt, detergent residues or other materials which will cause the WPB membrane to leak. Elastic adjusters on hoods, cuffs and hems of jackets. Velcro that looses its stick, adjusters/buckles that break or slip, etc. So What Fails Most Often? [Two high quality 2.5 layer jackets from big name outdoor gear companies] In my experience, membrane delamination like this in the neck and upper shoulders is the most common way that rainwear permanently fails. While this happens faster to the unprotected WPB membrane of 2.5-layer jackets like these — if you wear a 3-layer jacket long enough it too will eventually delaminate and leak. And backpackers beware: wearing a pack dramatically speeds up this delimitation process for both 2.5 and 3-layer jackets! As the pictures above show, WPB membrane failure is likely the first and most common, non-fixable way rain jackets fail (leak). And note that while the examples are dramatic, many small cracks, punctures, and delaminations are not obvious but will still cause your jacket to leak. This is true for 2.5 and 3-layer jackets, although 3-layer rain jackets usually last longer. This is one reason why the outdoor industry still makes a big deal about 2.5 vs 3-layer construction. 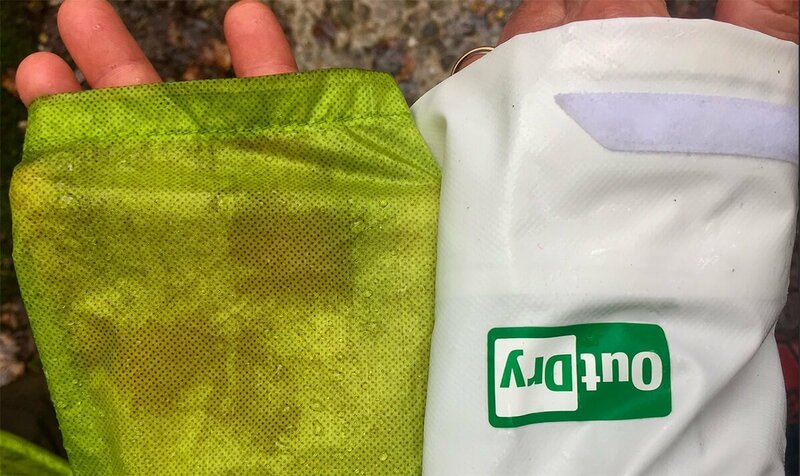 Note: Many outdoor companies like Patagonia, REI and Outdoor Research, offer good product warranties that cover zipper failures, membrane delamination, etc. This will protect your jacket as a long term investment. But if your jacket fails in the field you may have to suffer through wet until you get home and can ship it back for repair or replacement. On the left is a traditional fabric surface treated with a DWR that has already started to fail (wet out). Large wetted out areas will reduce the breathability of a rain jacket. In comparison, on the right is a newer, non-chemical water shedding fabric technology, Columbia’s naturally hydrophobic Columbia OutDry Ex Eco Tech fabric continues to bead and shed water. Wet out is another common “failure,” altho it can be fixed. Wet out happens when the durable, water repellent finish DWR no longer beads up and sheds water. The most common reason for this is the DWR finish (a chemical) wearing off after many garment washings, and/or the surface getting fouled with dirt and other compounds. While this doesn’t cause the rain jacket to leak, it does likely slow down the breathability of the jacket (see more below). This makes it easer to sweat out the inside of the jacket if you are working hard. Your DWR can be refreshed by washing the jacket and treating it with a DWR restoring wash compound and/or spray. E.g. some of these form Nikwax. Note: While, some newer fabrics like Columbia OutDry Ex Eco are inherently hydrophobic and don’t need a DWR. You will still need to keep the fabric free of dirt for best water shedding. It’s a myth rainwear stops breathing once it wets out. This is according to interviews I had with 1) Jeff Mergy, the Director of the Innovation Team at Columbia Sportswear (among other things tech. guy for OutDry Ex Eco Fabric and 2) Dr. Fred Wilson PhD a long term industry scientist who worked for both GORE and eVENT on WPB fabrics. Body oils, dirt, and other compounds can contaminate the inner WPB membrane and cause it to leak. This is another non-permanent failure that can generally be fixed by properly washing your jacket. Nonetheless this is a problem in the field as it can’t be easily fixed until you get home. 3-layer jackets are less prone to membrane contamination since they have a fabric liner that keeps them away from your skin, dirt, oils and other sources of contamination. From ‘B’ and ‘C’ it should be clear that keeping your rainwear clean, and refreshing the DWR are easy ways to improve the long-term breathability of an waterproofness of your rain jacket. So use products like these form Nikwax. Another fairly common failure are front zippers that jam, no longer mate at the bottom, or start auto-separating in the field. In my experience zipper problems are second only to membrane delaminations for “non-fixable” failures. It is why I prefer beefier toothed zippers (vs. coil) on my rain jackets, or even a 1/2 zip rain jacket that eliminates the always risky mating of the zipper at the hem. Finally, what rarely fails (at least in my 20+ years of using modern rain jackets) is the actual shell fabric of the rain jacket. I’ve used a large number very thin jackets over the years and they have rarely torn, ripped, punctured or had a seam fail. Generally, something else gets them first. (But I do avoid bushwhacking in sub 7 ounce rain jackets if at all possible.) Note that torn, ripped, punctured jackets are rarely covered under any warrantee, so the durability of a rain jacket’s outer shell fabric is a serious consideration if you think you might abuse your jacket. Two of the very best durable rain jackets. (Green – Right) Outdoor Research Realm with its extremely breathable, tough, semi-stretch AscentShell 3-Layer fabric. (Blue – Left) Montbell Storm Cruiser which manages a full feature set including big pit zips at only 10 oz. Both have chest pockets well above a pack’s hipbelt. Not long ago, a getting a durable rain jacket meant getting heavy bulky jacket that cost and arm and a leg. Now you can get a tough and durable rain jacket that is under 12 ounces and possibly as light as 6 – 8 ounces. And some cost less than you’d think! The following are our picks for the Best Durable but still Lightweight Rain Jackets for Backpacking. The cutoff weight for inclusion is approximately 12 ounces. We believe that for this weight you can get sufficient durability, features, waterproofness and breathability for all activities short of severe bushwhacking and intense alpine climbing (and even then… ). And while we do not exclude running or climbing/mountaineering jackets they also need to be well suited to backpacking (and some are). Note that many mainstream outdoor apparel brand offer “extremely durable” jackets. These jackets often use GORE-TEX pro with 50-70 denier fabric (or similar). They weigh 16-24 ounces and cost ~ $300-500. These have limited application in sports or professions other than hiking. We strongly believe they are far too heavy for hiking, backpacking or even lightweight mountaineering or climbing. At at almost 1/2 the price of competitor’s jackets the Rhyolite is a great value! FEATURES: The REI Co-op Rhyolite is a solid three layer jacket at a great price! It has two well placed chest pockets and adjustable hem, cuffs and hood. REI made some good design choices with this jacket: the pockets are high enough to use when wearing hip straps and it has mesh pocket linings creating two large and effective chest vents (which we prefer over pit-zips). Additionally, the Rhyolite’s seam-free shoulder design is good when wearing a pack and should increase durability in this critical area. If you’re planning on buying this jacket, note that the hem comes up just a little short in the back, and the fabric is a bit on the stiff side (it didn’t bother us). BEST FOR: Hikers and backpackers looking for a great value in rain protection with good breathability and great ventilation that can endure significant wear and tear. And it has the REI warranty! Note: the jacket uses the more waterproof/but moderate breathability 3-layer eVent DValpine™ fabric (20,000 g/m2/hr) vs. the more highly breathable DVstorm fabric (30,000 g/m2/hr). FEATURES: An unusual entry, the OutDry Extreme Eco uses newly developed eco-friendly, “1-layer” technology to make a mid-price, full featured, lightweight rain jacket with elastic drawcord hood (and hood velcro), velcro adjustable cuff, drawcord adjustable elastic hem, and two mesh chest pockets (great for ventilation). From our use the OutDry Ex Eco fabric is waterproof, breathable, and quite tough. And the OutDry technologies inherent water repellence prevents wet out without using traditional PFC-based DWRs. The jacket has a roomy fit for layering and nice length in the back for covering your tail. Some have criticized the Eco for keeping in the heat, but we have not found that to be the case. Note that compared to the other 3-layer jackets in this category, the fabric in these jackets feels odd, like your first rubber rain jacket in grade school. This may be off-putting to some. But we didn’t find it impaired its performance. And the all-white color while eco may not be some people’s ideal fashion statement for the trail. BEST FOR: Someone looking for an extremely durable jacket for frequent use that has long term waterproofness and breathability and water shedding (without need to refresh a DWR). This jacket might well survive the longest when worn continually with a backpack. Possibly the best all-around jacket in this group and at a reasonable price. FEATURES: The Outdoor Research Realm is a close competitor with the Montbell Storm Cruiser — they’re close in price, weight, feature set. What makes the Realm unique is its high breathability (30,000 g/m2/24h!) AscentShell fabric which also has stretch and a super nice feel. The Realm has two double pockets in the chest (one mesh, one waterproof with a subpocket for an iPhone in the mesh pocket), dual drawcord hood, tough toothed zipper, huge hood, velcro cuffs, and stiffened brimmed hood. The Realm also has great range of motion in the shoulder area making it well suited for climbing as well as backpacking . BEST FOR: Anyone looking for tough, highly breathable, full-featured rain that works equally well for hiking, backpacking or climbing. Note that the Realm does not have pit-zips, altho its fabric breathability makes these less essential. This is the #1 selling rain Jacket in Japan, a country crazy about hiking and getting outdoors. FEATURES: The Montbell Storm Cruiser is a full-featured, durable jacket that competes with the Outdoor Research Realm. The Storm Cruiser has all the bells and whistles while remaining at 10 oz! Drawcord adjustable hem, velcro adjustable elastic cuffs, big pit zips, two big waterproof chest pockets (above that pesky hip belt), a good-sized coil zipper and a three way adjustable hood (it’s quite deep). For venting the Storm Cruiser has two large pit-zips vs. the Realm’s single mesh lined chest pocket. This may be more to some people’s liking. BEST FOR: Anyone looking for tough, breathable, well designed rain jacket that has pretty much every feature, including large pit-zips! Note: This jacket is only available directly from Montbell. Note: The Patagonia M10 Anorak is the only jacket here that fits in both this 3-layer Durable Category and the ExtremeLight Category below. Quite an achievement if you can deal with the 1/2 zipper and minimal feature set! And it does have a nice chest pocket! FEATURES: The M10 Anorak has a huge hood, deep chest zip and Napoleon pocket. The zip on the front contributes to the durability of the jacket (much lower risk of zipper wear and separation) and the reduced feature set leaves less to break while still allowing for full functionality. The jacket does have a snug fit — we had to size up to fit the jacket comfortably. But the Anorak is a standout pick in our list for anyone looking for durability that doesn’t weigh you down. Additionally, the Anorak further improves durability by using tough “welded seams” and moving seams away from the back, neck, and shoulder area (places where the jacket wears the quickest). BEST FOR: The M10 Anorak is an excellent choice for someone looking for a long lasting fabric and feature set jacket that is incredibly light. Intended for athletes, the Anorak’s slim fit is extremely useful for runners climbers and others not looking for much insulation beneath a rain jacket. Given that, if you want to layer with the Anorak, you should consider sizing up. (R) Hyperlite Mountain Gear: THE SHELL jacket has unusually durable fabric and many full-sized features for its 5.8 oz weight. (L) Zpacks Vertice jacket has crazy high 56,000+ g/m2/24hr breathability!, 3-layer fabric and yet still weighs ~6 oz with a full feature set including pit-zips. Note: Hyperlite Mountain Gear: THE SHELL jacket is included for its unusually durable shell fabric, eVENT breathability and many full-sized features for its weight. BEST FOR: Ultralighters looking for the very lightest jacket but with a tough outer shell fabric — and don’t mind spending significant $. It’s better for less frequent rain vs. week-after-week wear with a heavy backpack on, e.g. wet climates like Pacific NW. Note: Zpacks Vertice jacket is included because of of its 56,000+ g/m2/24hr breathability!, 3-layer fabric (membrane durability) but still weighing around 6 oz and full-featured with pit-zips. TECH: 3-Layer “Ventum-WPB” fabric. crazy 56,000+ g/m2/24hr breathability!, Tricot lining, a waterproof, vapor permeable membrane, & 7 denier ripstop nylon on the exterior. FEATURES: The Zpacks Vertice is nearly twice as breathable as the next most breathable jackets in this guide—56,000 vs 32,000. Its 3-layer construction has a fabric liner to protect the WP/B membrane. It’s also the most fully featured jacket in this group, with a large dual adjustment hood with stiffened brim, pit-zips, adjustable cuffs, a large chest pocket, & long protective hem. BEST FOR: Ultralighters looking for the lightest jacket that is super breathable, fully featured including pit-zips, and with 3-layer construction to protect the WP/B membrane. Note that this has the thinnest shell fabric of any jacket (7 denier ripstop nylon). That being said, the fabric does not seem to be unduly delicate. Adjustment hardware is also among the smallest and lightest in this group making it harder to manipulate than larger hardware. If you will frequently wear your rain jacket with a pack on and/or use it bushwhacking etc. one of the durable rain jackets above is likely your best choice. Just to be clear, there is no perfect rain jacket. And there are implications for choosing the most durable rain jacket. That is, a rain jacket that scores highly on all of the durability features above will be expensive to very expensive and likely weigh 11 to 12 oz. This is about double the weight of the lightest rain jackets. And it is likely 2 to 4 times the cost of an excellent value rain jacket like the Marmot Precip. Why might you get a less durable rain jacket? 9 oz jacket like the REI Co-op rain jacket for only $70. 6.7 oz Montbell Versalite which includes large pit zips for only $169! Note: Lightweight and budget jackets will be covered in a future post. I’ve been an REI member since the mid 70’s. Still, when a REI sale comes around, I get overwhelmed trying to find the best lightweight gear among the vast inventory. This year, I decided to prep by going for a 2 hour visit to my local REI Store, and then doing research online selecting more great lightweight hiking and backpacking gear. The result is my Lightweight Hiker’s Guide to REI Gear Up Get Out Sale. EVENT: Gear Up Get Out Sale. Save up to 30% off at REI. Dates for the sale are 11/10 to 11/20, so get there early and look around to get the best selection. First: hit the REI GARAGE to use your 20% off any one GARAGE item. Stuff goes fast and sizes/colors are limited to begin with. I’ve noted a few items that I found to be good deals, but be flexible since sizes and colors can go quickly. And do some searching. If you’re a small or very large person, you can totally score here. I’ve only put in items that had several good sizes. Keep in mind that something labeled “men” might be good for women, and vice versa. Second: Hit the Regular REI Sale Items (I have some picks below). The best items on sale will go quickly. There’s a section below that has Regular Sale Items I thought were good. Third: shop Full-price Items. This is the last area I would look over. Again in a section below, I have noted some high priced items where 20% off would be welcome, as well as some lower cost options. Oh, and Patagonia R1 Hoodies & Pullovers are 30% off – might be my favorite sale item! Think of it as “fur for humans.” Possibly the most versatile cold weather base layer ever made. It works over an astonishing range of conditions. Mine has been to many a mountain top all over the world. The 12 oz REI Co-op Rhyolite with its breathable 3-layer eVENT fabric is durable AND Light. At half the price of competitor’s jackets, it’s a great value! The Rhyolite jacket is on sale at at 40% off – $113! REI made some good design choices with this jacket: the pockets are high enough to use when wearing hip straps and it has mesh pocket linings creating two large and effective chest vents (which we prefer over pit-zips). Mobile Users – turn your phone sideways for best viewing! MH uses a unique “Whisperer 7D x 10D Ripstop” fabric that is light, tough, down proof, and fairly water resistant. Oh, and the Mountain Hardware Ghost Whisperer has won a ton of awards. A steal if you also use your Members Get 20% off one REI Garage Item. This jacket has been a staple of the ultralight crowd for years. My wife and I both own one. It’s not the cheapest jacket but it’s light, and uses a generous 3.5 oz of 800-fill-power traceable down. It comes in both a jacket and a hooded version for a little more money. The hooded version is hands-down our favorite! A good pair of hiking shoes, ain’t cheap. So these might be a good choice for the your 20% off any one Garage item. These are Alison’s and my favorite backpacking and hiking shoes. These are the most comfortable shoe after a 30+ mile day on the trail. One key is the massive toe room that is so kind to trail-swollen feet at the end of the day. They are light and have a zero drop heel for a more natural stride. These come in both Men’s and Women’s models. We also like the lighter and award winning Altra Superior shoes. We have even taken them technical canyoneering with good success. M’s model and W’s model. One thing that makes the Superiors stand apart is upper fabric is that it stops sand and grit entry while still being breathable! These shoes are the favorite of many serious thru hikers and ultra runners. They’re inspired by Karl Meltzer and the rugged conditions of the Speedgoat 50K race. Since this gear is already on sale, you can’t use your 20% off any one -full-priced item. But there are some great deals here that can lighten your pack. 30% Off All M’s Patagonia R1 Hoodies & Pullovers – possibly my favorite sale item! Think of it as “fur for humans.” Possibly the most versatile cold weather base layer ever made. It works over an astonishing range of conditions. REI Co-op Rhyolite Rain Jacket M’s & W’s $189 – 12 oz now 40% off – $113! One of the best hardshells out there and it costs far less than the competition. The REI Co-op Rhyolite is a great three layer jacket with two well placed chest pockets and adjustable hems, cuffs and hood. REI made several clever design choices with this jacket: The pockets are high enough to use when wearing hip straps and use mesh pocket lining to creating two effective chest vents for backpackers. Additionally, the Rhyolite jacket is REI’s durable rain jacket, due to tough fabric and seam placement on the shoulders -they directed the seams away from high friction areas on the shoulders and back where a backpack would accelerate wear. If you’re planning on buying this jacket, note that the hem comes up just a little short in the back, and the fabric is just a touch stiff (these issues can be solved with thoughtful sizing). BEST FOR: Hikers and backpackers looking for rain protection with good breathability and great ventilation that can endure significant wear and tear in formidable conditions. We particularly like the REI Co-op Flash Carbon Trekking Poles. They are light, strong, and travel friendly. We’ve taken them all over the world. If you want to cut a little weight, but keep lots of space, Big Agnes has you covered with their Copper Spur ultralight freestanding tents. They are some of the most spacious backpacking tents out there, which is great if you are going to be stuck in your tent playing cards for a while in bad weather, or just prefer highly livable tents. 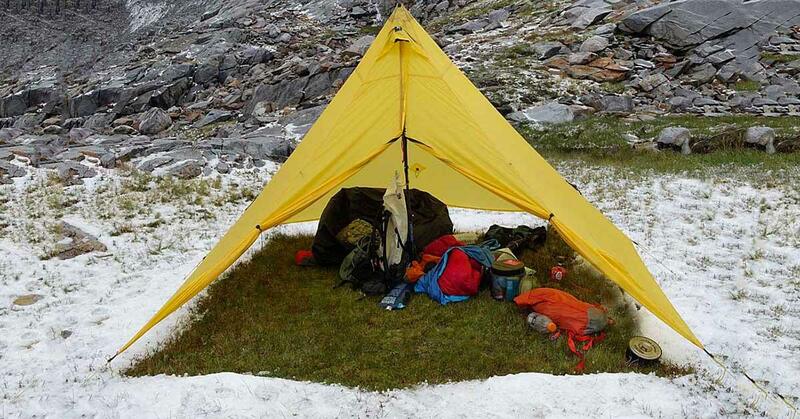 The Big Agnes Copper Spur HV UL 2 Tent is a longtime favorite among ultralight backpackers. The Jetboil Flash stove is an all-in-one stove, heat exchanger, pot combination. It’s a great option if you want hot water quickly in camp – it’ll get your morning coffee boiling in just two-and-a-half minutes. That’s 3-4 times faster than an alcohol stove system. At 15.2 oz, it’s not too heavy. Or you could consider the Jetboil FlashLite, which weighs 4 oz less, but has a lower 0.8 L water capacity vs. 1.0 L for the Flash. A Patagonia Ultralight Classic! Compared to fleece its lighter and more compressible for equivalent warmth. And unlike down it still keeps you warm when wet. Similar to the lauded Patagonia UL Down Jacket but less than 1/2 the price! The REI Magma 850 down jacket offers easy movement and just-right warmth for backpacking, hiking and travel. The original antimicrobial, non-stench fabric that keeps you warm when its wet. Lots of garments and styles on sale to suit every need and taste. If wool isn’t your thing… light and durable Patagonia Capilene Midweight baselayers are a great option. We are particular fans of the Patagonia Capilene Midweight Zip-Neck Long Underwear Top with its long, center-front zipper for easy venting when you work up a sweat, full underarm gussets and raglan shoulder seams that provide unhindered shoulder mobility, and elastic thumbholes that keep sleeves from riding up and provide partial coverage for your hands. I like Wool Socks and use them for all my hiking. Darn tough socks are among the best. And they make tons of non-wool socks if that’s your thing. I prefer thinner socks with lower tops. Ring-toe construction hides seams and enhances comfort. Made in America with American-sourced materials. And tons of fun colors and patterns! Warm, comfortable, light and compact. What more do you want? The Therm-a-Rest NeoAir line sets the gold standard for backpacking sleeping pads. This is the “Women’s” version of the XLite, but it’s the right size for most backpackers (all the men I know use it). At 12 oz and with an R-value of 3.9, it’s warmer and lighter than the “Men’s” version. This pad will be a go-to piece of any backpacker’s sleeping kit. A Thru-hiker’s choice and a darling of the Appalachian Trail and Pacific Crest Trail. The Osprey Exos 48 is light but will still hold enough gear and food for 7 days. Best of all, at under $200 it’s a good deal for a pack of this weight and quality. This 2017 Backpacker Editors’ Choice will keep even cold sleepers warm. This Women’s specific bag is rated to 17 °F and stuffed with 850 fill power water-resistant goose down. The weight is not bad at a little over two pounds. The Men’s version is essentially the same bag but rated 10 °F because Men sleep a bit warmer. This puts it into 3+ season capability. A value 3 season bag for under 2 pounds. Water-repellent 700-fill-power duck down keeps the price low. Strategic waterproof/breathable fabric panels improve its wet weather performance. This Women’s specific Joule bag is rated to 30 °F and the Men’s Igneo bag is rated to 30 °F. This is 1/2 the weight of the bags above it! A very warm one-pound Ultralight bag wth high quality 850 fill power water-resistant goose down. EN rated to 33 °F, and with a full zipper which is a pleasant surprise in a bag this light! A good pair of hiking shoes, ain’t cheap. So these might be a good choice for the your 20% off any one full price item. These are Alison’s and my favorite backpacking and hiking shoes. These are the most comfortable shoe after a 30+ mile day on the trail. One key is the massive toe room that is so kind to trail-swollen feet at the end of the day. They are light and have a zero drop heel for a more natural stride. These comes in both Men’s and Women’s models. If the a big toebox isn’t your thing, these are some very light (under 10 oz) shoes that are super comfortable. They’ve got tons of padding to protect your feet, great ventilation and super grip from aggressively lugged soles. Like the Altras above, these have a low heel drop, which we prefer. In Men’s and Women’s models. This functional rain jacket is under 10 oz. and a great bargain! Most of us end up tearing or wearing out a rain jacket after a few seasons anyway, so why spend the big bucks? This jacket comes in both Men’s and Women’s sizes (9.4 and 8 oz respectively), has zippered pockets and an adjustable hood making this 2.5-layer breathable waterproof jacket a an excellent deal! These little day packs are great. They are light in an era when many “daypacks” approach the heavy weight of long distance backpacks. With the weight savings you can carry a camera, a drawing pad and pencils, or some extra food. Theses packs hold just the right amount for a day (18 or 22 L), and don’t have too many bells and whistles. Simple, inexpensive, and good. This simple drawstring design has been with us for years, because it has proven itself to be perfect for just about any day-long mission. There are some fancy colors in the Special Edition 18 Pack and the Special Edition 22 Pack. As of November, 2017 Amtrak offers service to Roanoke, VA. This makes another stunning section of the AT accessible via public transportation to most of the East Coast. This hike is just south of Shenandoah National Park. It’s every bit as beautiful as “The Shen” but wilder and without the crowds! The guide that follows gives you all the information you need to do this Appalachian Trail Section Hike – Roanoke to Shenandoah National Park. Leave the car at home and hike green! More superb ridge walking: The Appalachian Trail as it meanders over Cole Mountain Bald. This is the 3rd installment of our no car needed, Appalachian Trail (AT) Hiking Guides. We are big fans of leaving the car at home when hiking. Because the AT goes through or near urban areas, it’s not difficult to section hike portions of the AT using only public transportation. Many of these are among the nicer sections of the AT. This guide is for an AT section hike that you can undertake solely using public transportation from Washington, D.C. and/or much of the east coast. This 134 mile AT section could be done in one long’ish week (7-11 days). It would also be a great hike for fall color viewing as it has much less foot traffic than the adjacent Shenandoah Park. Many sections of the Appalachian Trail were lush with late summer wildflowers like this climb to Saltlog Gap & Bluff Mountain. Amazingly wild and remote for Central/Northern Virginia. This section goes through many Wilderness Areas with few road crossings and tons of wildlife and wildflowers! The trip takes between 7-11 days [We did it in 6.5 days]. You can also do it in parts. 134 mile – trip end, Rockfish Gap, the intersection of the Blue Ridge Parkway and I-64. 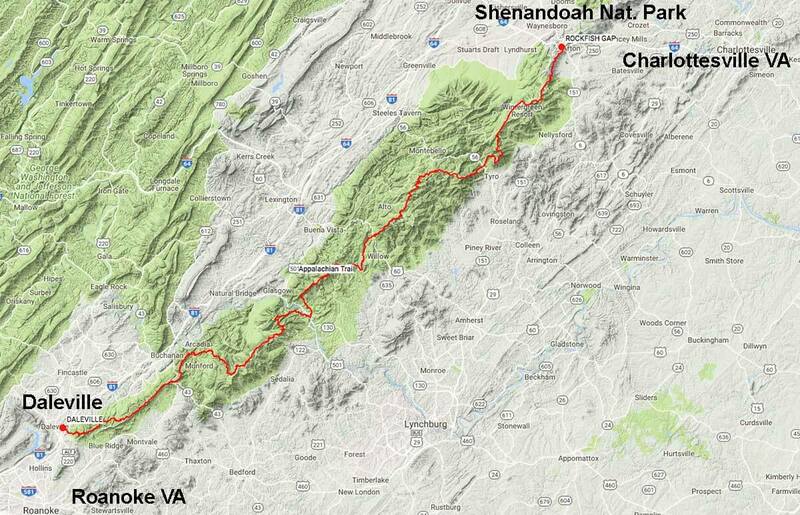 It’s about 25 min W of Charlottesville, VA, and marks the southern border of the Shenandoah National Park. It’s about 5 hours on the train from Washington Union Station* (Wash. DC) to Roanoke, VA. Train times are convenient, leaving Washington at 4:50pm (right after work) and arriving Roanoke at 10:00pm. It is another 20 minutes to trailhead via Uber or Lyft from the train station. * NOTE: These trains actually originate in Boston so you can catch the same train anywhere along the Northeast Corridor and it will bring you directly to Roanoke. Our guide gives more details for this specific section of the AT, and in particular how to access it by train and bus from much of Northeast US. Lighten your load: The GEAR (link) and FOOD (link) for the light packs we used to efficiently and comfortably hike the AT. A light pack will make the hike more pleasant for everyone! Food: a link to list of the FOOD we took to save food weight but still eat healthy. Important since this AT section is lean on close-to-trail food resupply options. This hike begins at Daleville, VA, just north of Roanoke, VA on US 220. We recommend taking the train, spending the nite in Roanoke or Daleville, and starting your trek first thing the next morning. From the train station, you have several options. The train drops you right in downtown historic Roanoke. If you want to get a good nite’s sleep, and treat yourself, stay in the grand Hotel Roanoke (www.hotelroanoke.com), literally across the street from the train station. If you want to get closer to the trail (and stay somewhere a bit cheaper), you can stay steps away from the AT at the Howard Johnson Express, Daleville (a favorite of AT thru-hikers). Either way, you can catch an Uber or Lyft to the HoJo’s or the trail-head (about $25) from the train station. The trip ends at Rockfish Gap, just before the Appalachian Trail enters the Shenandoah National Park. We found it surprisingly easy to get an Uber or Lyft from there to Charlottesville (we waited 10 minutes). Cost was about $35-45. Once in Charlottesville, take either the Amtrak train or the Greyhound Bus to get back up north. 7:09am, Train 20, The Crescent -comes thru from New Orleans heading north early (goes all the way to New York Penn). But this train is often times late so watch the times on the Amtrak.com app, time is 2 hr 44 min to Washington. 8:52am, Train 176, Northeast Regional ONLY MON thru FRI — this is your quickest option if weekdays work for your hike at 2 hr 22 min. This train ends in Boston. 11:13am, Train 156 Northeast Regional ONLY ON SAT, SUN –this is your quickest option if the weekend works for your hike at 2 hr, 22 min to Washington. This train ends at NY Penn. 3:19pm, Train 50, The Cardinal, ONLY SUN, WED, FRI –comes thru from Chicago heading north (goes all the way to NY Penn) but can also be late so watch the Amtrak app for times. Time is 3 hours to Washington. Day 1 of trek, AT railroad crossing is near Troutville VA. Photo: Ron Bell of Mountain Laurel Designs. Shelters are not consistently placed at even distances. You may end up with a longer or shorter day than you wished so carefully plan each day. There are a few steep and rocky climbs. Make sure you pay attention to elevation profiles. Late season water can be scarce high on the ridges. It’s good to know where your next water sources are (and if it’s dry have a backup(s) as well). This section has no on trail or close-to-trail food resupply options. To resupply for food, you’ll need to go significantly out of your way. As such, we did the entire 134 section without resupply for food. This made the hike significantly faster and more efficient. But our packs were less than 15 pounds including the food we carried. Please see our food list, “Best Backpacking Food – simple and nutritious” to get the best nutrition for the lowest weight while still being tasty. It matters! The start of the 134 mile trek in the Daleville/Troutville area is about 20 minutes north of Roanoke, VA.
One of the best parts of hiking the AT is the interesting people you meet and share the trail with. Pictured are Rick Elliot and Kerry (?). I spent the first night of the trip with them at Bobblets Gap Shelter. Both are Vietnam Vets and cancer survivors. Long story short, but they always had plans to thru-hike the AT together when they retired. Then at retirement one of them got cancer and the other put off the trip until his friend got better. Then, when the first got better the other got cancer. By the time they were both well enough to hike they decided to do the trek in 500 mile sections, which is where I met them. Gotta love these guys’ spirit and positive attitude! “The Guillotine” a perilously perched boulder wedged over a narrow slot that the AT passed through. You can see the white AT blaze at the end of the slot. The tops of ridges can be a bit blustery (see Alison’s hair) but the wildflowers don’t seem to mind. “I even had a salamander crawl up my leg one night in camp!” We hiked for 3 very wet days in the remnants of Hurricane Harvey. I don’t think I’ve seen as many turtles, frogs and salamanders just lovin’ life! The rain enhanced early fall colors in the high mountains. Apples from an old orchard directly over the AT. We picked apples with our feet still on the trail. Moss covered John’s Hollow Shelter. We weathered some of the worst bands of rain here with sheets of water cascading off the roof overnight (thus the moss). We left warm and dry the next morning. There is a great kettle corn truck here. It’s even Trip Advisor rated! Get some while you wait for your Uber. 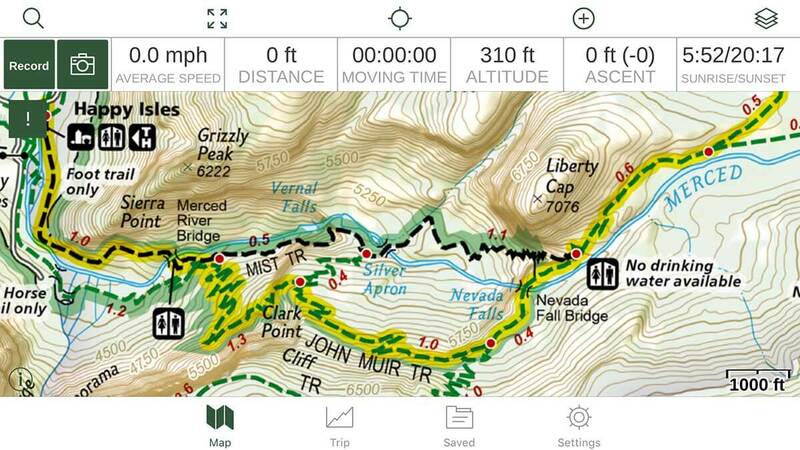 It’s no mystery that Gaia GPS is the best hiking navigation App. But the Next Gen GAIA GPS Hiking App is vastly improved. The new maps are stunningly sharp and legible. It is much faster, and easier to use. 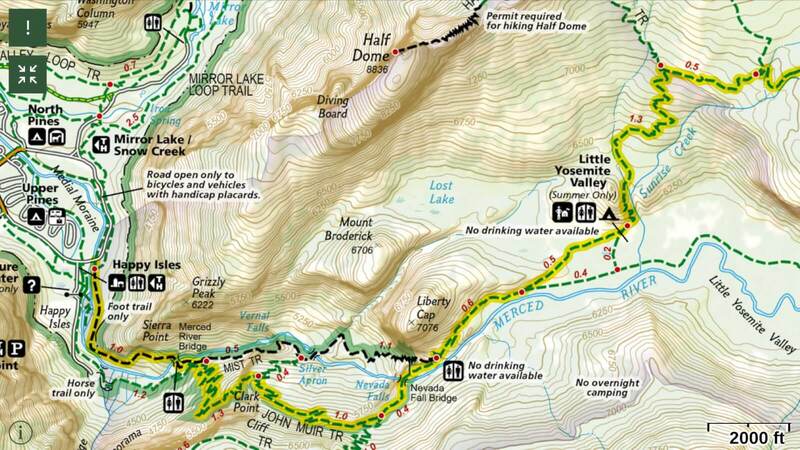 And possibly the best feature of Next Gen GAIA GPS is the full line of National Geographic Trails Illustrated Maps. They are most trusted and highly-rated maps for America’s top outdoor destinations. Lead photo: you get the exact same level of detail and quality on the Next Gen GAIA GPS as on the highly regarded paper versions of National Geographic Trails Illustrated Maps. Better yet, you get ALL the NG TI maps with your GAIA PRO subscription! Addition of National Geographic Trails Illustrated Maps, the most trusted and highly-rated maps available for America’s top outdoor destinations. They give you current trails, distances, and other official park info. Vs. USGS TOPO maps where this info is 50 years out of date or just missing. New vector-based maps look sharp and beautiful at every zoom level, with incredible legibility! The new vector map engine is much faster than the old raster-based one. Finally map files are much, much smaller, saving space on your phone. Worldwide vector basemap so you are never without at least one map type! I am not a big fan of the folder management system for maps, tracks and waypoints. It could use huge organizational improvements. I would like an “active folder” function where all new tracks, waypoints, and maps are automatically added to it. And it needs a way to bulk select and manipulate waypoints. Moving them into folders one by one, doesn’t cut it. Right now there is no way to completely disable the GPS. Now this is not such a big deal since GAIA only uses it briefly to get your position. And it is extremely battery efficient. But I am sure that some power users, wanting map viewing only, will want the option to disable the GPS. The classic Gaia GPS app (iOS) will no longer be available on the App Store after May 22. People can continue to use the classic app with no interruption. Existing app users get an extended free trial with the new Gaia GPS. The more recently they bought Gaia GPS, the longer the trial (between 30 days and 2 years free). Also, existing users with “GaiaPro” subscriptions from the classic app get access to the new app at no additional cost, including all Premium maps. * Android Classic GAIA PRO users do get upgrades to include National Geographic, and NeoTrex maps. Not so bad, since the NG Maps are one of the best feature of the upgrade. The old Gaia GPS cost $19.99 and had an optional $39.99/year GaiaPro subscription. The new Gaia GPS has a free trial, and two price levels. For a limited time, the new Gaia GPS app costs $9.99/year for the Member level, or $29.99 for the Premium level. The Member Level lets you use the full app, and all but a few map sources – try it free for 7 days. The Premium Member Level gives you access to sources like National Geographic Trails Illustrated, hunting data, and other specialized maps. And if this pricing seems a bit confusing here’s a FAQ on Gaia Pricing, Levels, and Features.